At Wellston Pawn, We offer a large selection of pre owned tools for all of your mechanic, carpentry, and construction needs. Our staff does a great job keeping our hand tools in a neat and organized fashion. Saving you TIME and MONEY. Best of all, our hand tools are sold by the pound, stretching your dollars even further. We offer a variety of power tools from popular brand names such as Makita, Milwaukee, Dewalt, Porter Cable, Hitachi and Hilti. 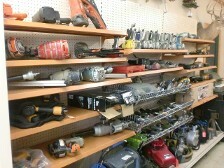 We have Corded and Battery operated tools for all of your power tool needs. From Framing Nailers to Air Drills, We have the Air tool you need to get the job Done!